ARCATA – The Forest Management Committee (FMC) met Thursday, Feb. 14 to discuss Arcata forest issues, of which there’s never any shortage. 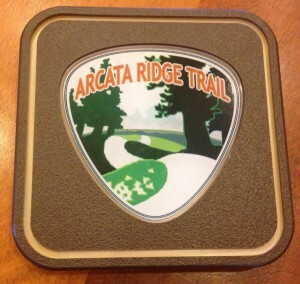 Topic A was the big push to close the deal on the Arcata Ridge Trail. After years of fundraising, grants and purchases, the final link – a 2.5 acre parcel known as the Humphry Property, located at the Fickle Hill Road trail crossing – is all that’s required to fully acquire the trail. Five of these collectible Arcata Ridge Trail markers, with the logo designed by Dave Held, will be available for $65 each. A $180,000 grant is anticipated, leaving an estimated $10,000 gap. Those wishing to assist with closing that funding gap may make a donation via the Humboldt Area Foundation website, make a check out to the City of Arcata Forest Fund and send or deliver it to City Hall, or donate auction items to and attend the Arcata Eye Ball on Saurday, March 9 (see pages 2, 10). Environmental Services Director Mark Andre said that since word of the final funding push has come out, donations have been rolling in. Issues that will have to be resolved are safety and the difficulty of the grade on the southern approach to the Fickle Hill Road crossing. Motorists notoriously speed on the narrow, winding street, and increased presence of pedestrians could prove perilous. “There’s no warning coming down Fickle Hill, so if you had 15 cars there, bikes and strollers, it could be a problem,” Andre said. His preferred solution could prove costly, and would need clearance from multiple bureacracies. “A big culvert under Fickle Hill would be perfect,” he said. “They use them on trails all the time.” The culvert would be lit with LED lighting. Another problem is the extremely steep uphill grade on the southern approach to the crossing. Options include creating stairs or switchbacks to lessen the steepness. “Once we close escrow, we can talk in earnest about those details,” Andre said. Meanwhile, the City is pursuing the possibility of establishing a Sister Forest with the Central American country of Belize (see page 5). Such a relationship could include visits by Arcata and Belize forest management personnel to each others’ forests to exchange information and expertise. This entry was posted on Tuesday, February 26th, 2013 at 10:57 am	and is filed under News, Business, Environment. You can follow any responses to this entry through the RSS 2.0 feed.